I received these items to review from F & F Clothing at Hy-Vee. Omaha ladies, this one is for you. If you haven’t heard, select Hy-Vee stores have recently added clothing stores alongside the grocery aisles. While some may laugh at this idea, I think it is genius, especially if it is done well. I already shop at Hy-Vee because I love their service and selection, but now I can also check out clothes and accessories for the whole family while I’m there?! SOLD. I am happy to report the collaboration between F & F Clothing and our local Hy-Vee is exactly what I hoped for! 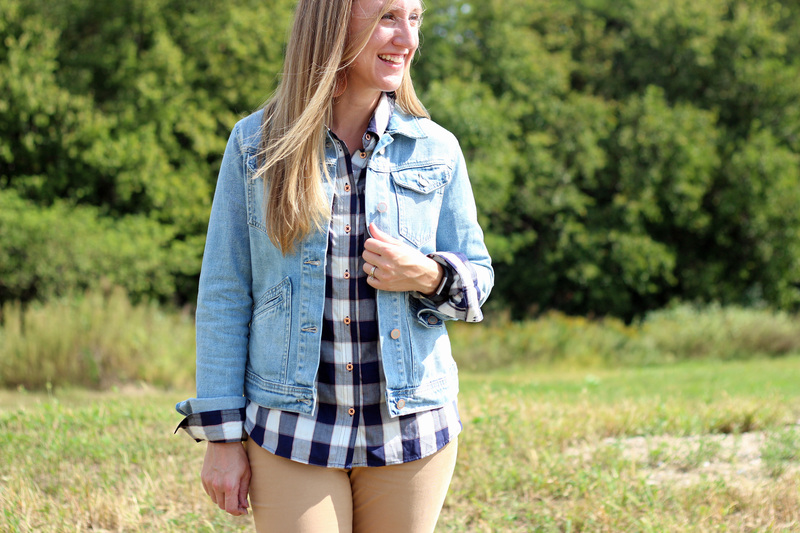 Between back to school clothes for the boys, new fall styles for me, and even a fun hat, we’re all excited about F & F Clothing, so it’s time to share the fun with you with a fall outfit I’m loving! Side note: It was sunny, windy, and 90º during this photo shoot. The fashion blogger life is so glamorous. 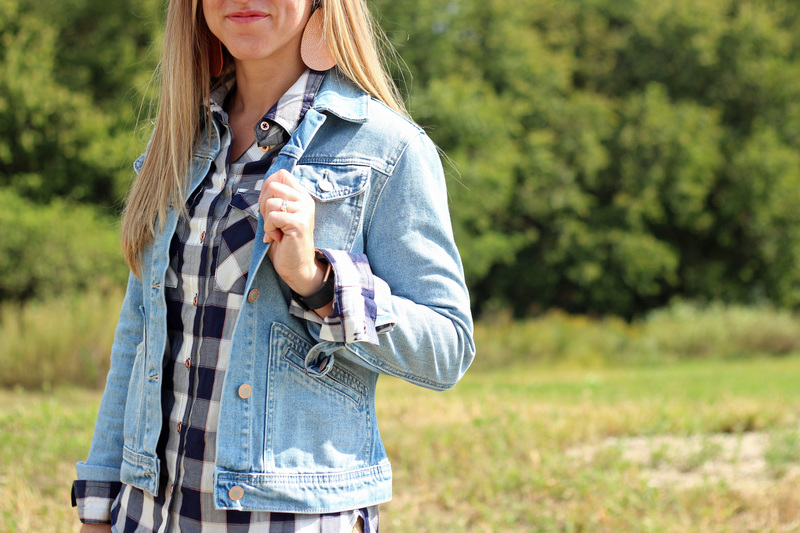 Jean jackets and plaid shirts and skinny jeans…ah, I love fall. 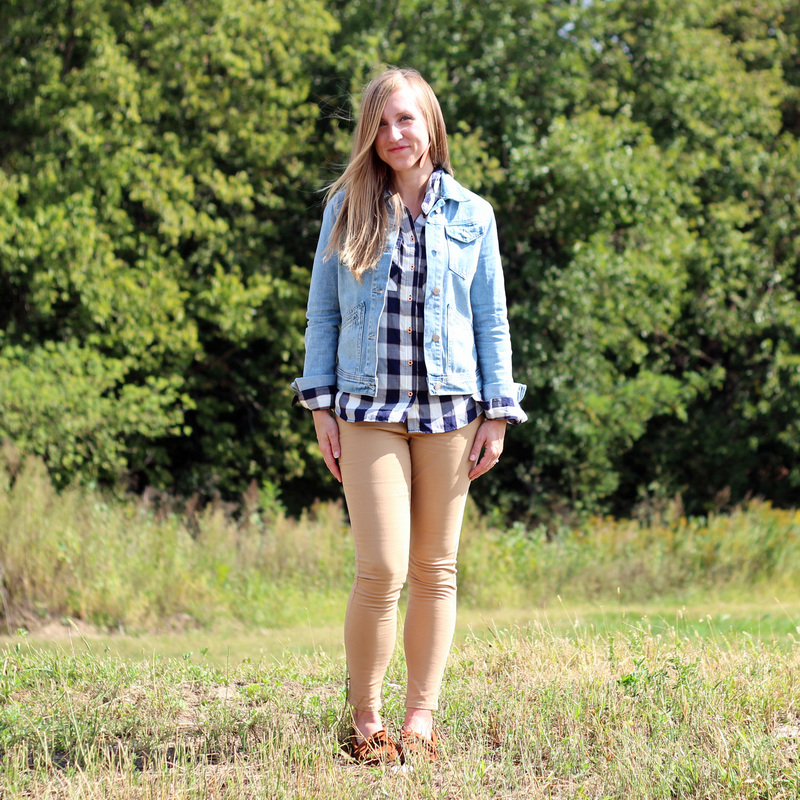 F & F Clothing has all the fall colors and styles to update your wardrobe as the seasons change! 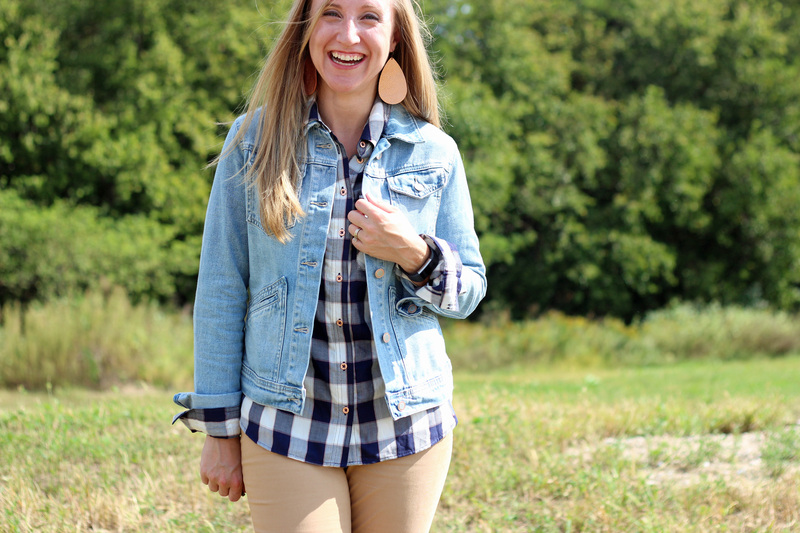 I’m all about plaid shirts when fall arrives, but I’m not quite ready for full-fledged flannel! 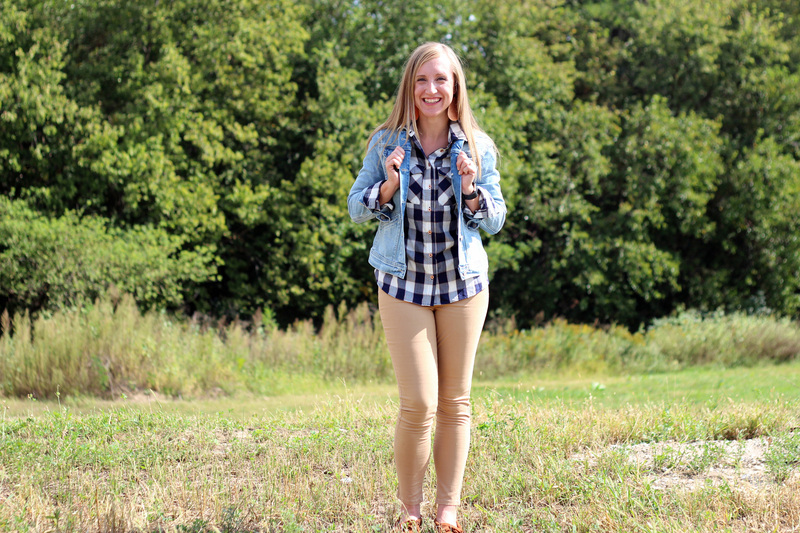 This lightweight plaid shirt is perfect for the seasonal transition. The navy and white make it versatile, but the copper stitching gives it the perfect amount of flair! These skinny pants are called the “push up jean” because of their high waist and skinny fit. Hallelujah for high-waisted pants! I went with a khaki color because it will pair well all fall and winter with my favorite tunics. Because these are more of a pant than a jean, there are no belt loops, which is the only drawback for me. I love the fit and length and they come in both neutral and flashy colors! Last, but definitely not least, let’s talk about this denim jacket. It is hands-down the best denim jacket I’ve ever tried on in my whole life. It is amazingly soft and fits me perfectly. This is one of those pieces I will have in my closet forever. This whole fabulous outfit came from F & F Clothing at Hy-Vee in Omaha, located at 180th and Pacific! Even if you don’t live near this Hy-Vee, you need to make the trip to check out the selection for yourself, your husband, your kids – everybody! 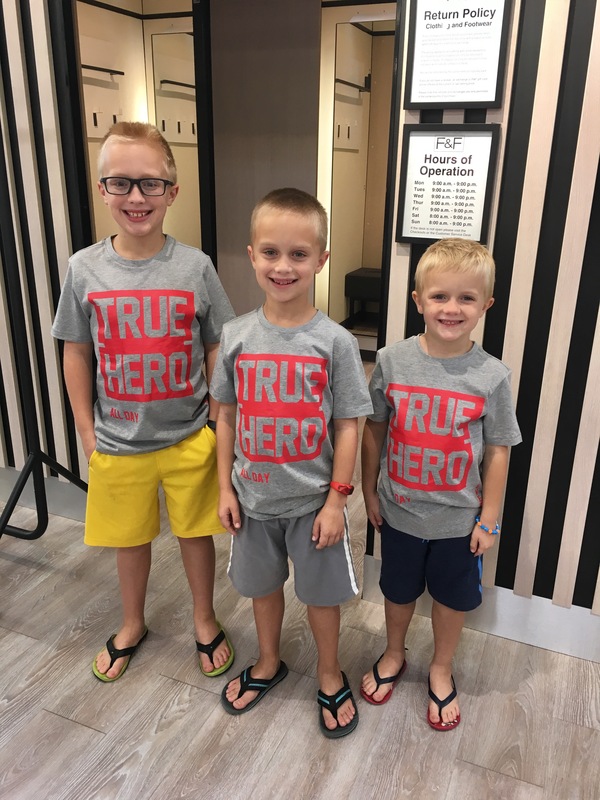 And when you do visit for the rest of September, tell them you’re visiting from Home with the Boys and get 25% off any regular-priced items! Matching shirts for the boys! Regular price was around $10, but they were on sale for less than $6 each! Fun hat for all the seasons! Less than $20! A note about sizing: The staff is super helpful in figuring out what size you wear in this brand because it won’t be your “normal” number size. In general, subtract 4 from the number on the hanger to figure out the US size. For example, a size 10 in F & F Clothing will fit like a size 6. If you’re not sure, just ask! 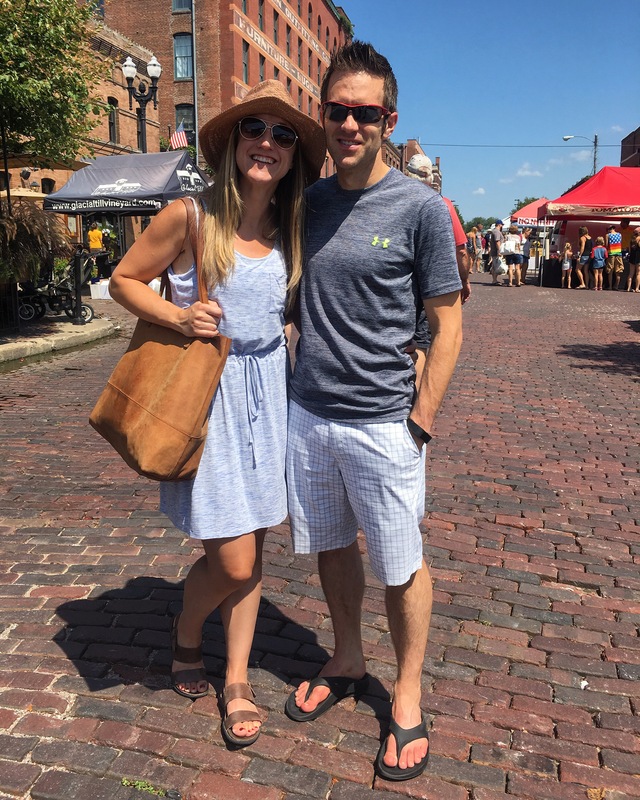 You really need to check out F & F Clothing at Hy-Vee for yourself! Don’t forget: shop in store in September, tell them Home with the Boys sent you, and get 25% off all regular price items! Have you shopped F & F Clothing at Hy-Vee yet? Follow F & F Clothing at Hy-Vee on Facebook for updates on all the latest sales and new fashions!